Continuing to write the remarkable story of Lismore, Waterford's Lismore Short Stories collection combines various iterations of the world-famous pattern with a classically lavish element of modern matte gold and bold black marble. Showcasing the popular interpretation of the Lismore pattern, this Lismore Diamond set of three combines history and style for the ultimate gifting solution. Completed with a black marble base, this item is beautifully presented in classic Waterford packaging. 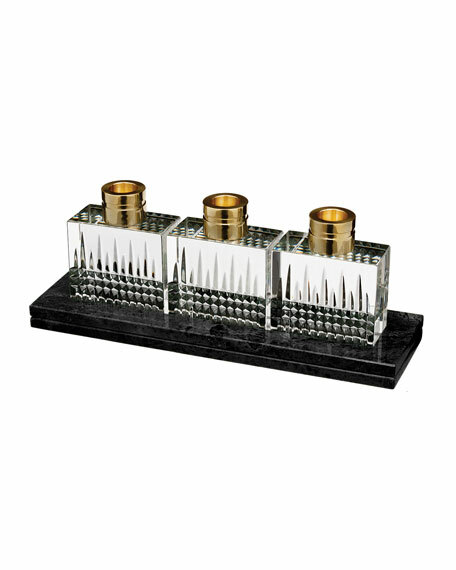 Three lead crystal holders sit on a marble base. 3.1"W x 1.6"D x 3.9"T.